Be the first to share your favorite memory, photo or story of Joel. This memorial page is dedicated for family, friends and future generations to celebrate the life of their loved one. 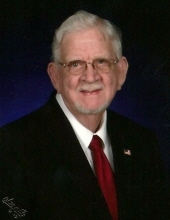 Funeral services for Joel Wayne Gilliam of Cordele will be held at 3:00 p.m. Friday, February 1, 2019 in the chapel of Rainey Family Funeral Services. The burial will follow in Zion Hope Cemetery. The family will receive friends prior to the service Friday beginning at 1:00 p.m. at the funeral home. Joel, 87, passed away Tuesday, January 29, 2019 at Crisp Regional Hospital. Born in Hood County, TX, he was the third son of teachers Charles Hadden and Ima Lockhart Gilliam. Joel was an USAF veteran of 21 years in uniform, and 16 years in civil service where he was an outstanding instructor and manager of computer operations. Upon retirement from the Air Force he was employed by and consultant for Federal National Mortgage Association (Fannie Mae) in Washington, D.C. before moving to the Montgomery, AL area as a part of the team for the Air Force Data Systems Design Center. Upon retirement from Civil Service he and his wife settled in Cordele. Joel is survived by his wife of 36 years, Imogene, daughter Missy G. Moore; son Timothy Stephens (Beth) Downing; daughter-in-law, Melissa Brown (Stacey) Roberts; grandchildren Kevin Joel Moore, Kyle Brandon Moore, Brittany Morgan (Brian) Pittman, Erin Skylar Downing, Whitney Haralson (Kyle) Bridges, Zackery Dale (Jasmine) Downing, Peyton David Downing, Garland Sumner (Melissa), Slade Sumner (Haley), Logan Baughman (Kara), Savannah Baughman and bonus granddaughter Josie Roberts; great grandchildren Abigail Jane Moore, McKenzie Grace Bridges, Spindel Lee Bridges, and Harper Fynlee Pittman, Masen Jack Downing, Jackson Sumner, River Sumner, Forrest Sumner; a sister-in-law Marie (B.W.) Tuton; and a number of nieces and nephews. Joel was a cancer survivor since 1993. He is preceded in death by his wife Edwina Munson Gilliam, parents, sons Edwin L. Gilliam, Scott D. Downing, and brothers, Charles H. Gilliam, Jr. and Curtis G. Gilliam. A devout, dedicated, and active Christian, Joel gave his time, his talents, his tithes and gifts in his service. He was a member of Morningside Baptist Church in Cordele and taught adult Sunday school classes and served as deacon in a number of churches to include Morningside Baptist Church and First Baptist Church in Cordele. Joel received a college football scholarship, played tennis, and was an awesome fast pitch softball pitcher. He was an accomplished woodworker who fashioned many items for their home and church. The community will remember Joel as an avid golfer, who promoted and participated in many tournaments at Pine Hills Country Club, where he was a past president, and at other courses in the area. Joel was an expert Golfsmith. He was a member of the Billy Clary Band for over 20 years. The family extends a special thank you to the Reflections Hospice group for professional care and kindness during this very difficult journey as well as to the many gracious and caring employees of Crisp Regional Hospital and Crisp Regional Nursing and Rehabilitation and special recognition to caregivers Gail Williams, Kimberly and Sam Sneed. Memorials may be given to Morningside Baptist Church or your charity of choice. To plant a tree in memory of Joel Wayne Gilliam, please visit our Tribute Store. "Email Address" would like to share the life celebration of Joel Wayne Gilliam. Click on the "link" to go to share a favorite memory or leave a condolence message for the family.